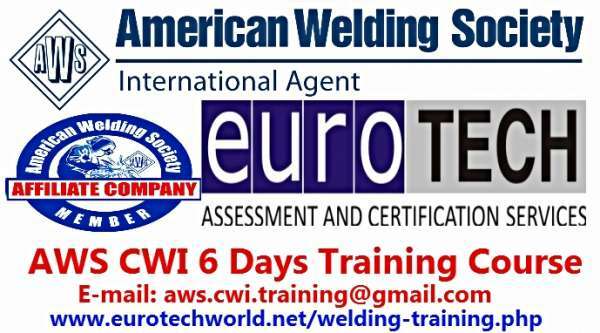 Eurotech conducting AWS CWI 6 days Training Program and 1 DAY OFFICIAL EXAM.CWI (Certified Welding Inspector) as per AWS (American Welding Society) involves great responsibility and remarkable skill demonstration. The CWI (Certified Welding Inspector) is widely recognized, both nationally and internationally, and successful companies have come to rely on this certification when ensuring the highest level of quality workmanship. As a Certified Welding Inspector (CWI), you will find this career path lucrative and rewarding. This certification can lead you to a career that is engaging and promising on all levels. If what you need is a stable career where you will thrive and find fulfillment, then the Certified Welding Inspector CWI certification is the answer. If you are interested to attend our AWS CWI program, you can write or call me to assist you.